BURBANK, CA--(Marketwire - November 18, 2008) - The Nap-Stik Napkin Helper, a value-added device that empowers everyone to keep the earth cleaner, today makes its debut. The patent-pending mechanism revolutionizes the struggle of keeping napkins in place, while helping napkins to protect clothing, reducing cleaning expenses and making the planet a better place. The Nap-Stik Napkin Helper can be used anywhere food is involved (fast food and full-service restaurants, amusement parks, sporting events, hospitals, senior centers, mall food courts, daycare facilities, special events and during travel), in addition to anywhere that clothing needs to be protected (dental offices, cosmetic counters and craft tables at school or home). "For just pennies, Nap-Stik will help your napkin protect your clothing," states inventor Anthony Karg, who conceived of the Napkin Helper after he soiled his suit during lunch just minutes before an important business meeting. "We believe that our fun and easy-to-use device will bring peace of mind to diners everywhere and will quickly become every mom's best friend, helping to protect their children's clothing from the typical icky, sticky mess that pervades kids while eating." 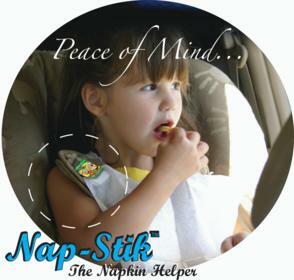 The Nap-Stik Napkin Helper provides businesses with the unique opportunity to create additional revenue by significantly reducing napkin waste, as well as by customizing the mechanism with fun images or their logo and using it to advertise promotions, redeemable coupons or other marketing messages. Additionally, Nap-Stik enables establishments to save money (by minimizing the number of napkins used), while assisting their patrons and keeping the earth cleaner. On average it is estimated that most people use between 3-12 napkins per meal depending on the venue. With The Nap-Stik Napkin Helper, the reduction in napkin waste could result in millions of dollars in savings for establishments dispensing napkins, as well as a huge reduction in napkins dirtying the ground and contributing to the billions of pounds of paper dumped into our landfills every year. To learn more about Nap-Stik, or to place an order, please visit www.nap-stik.com. The Nap-Stik Napkin Helper, a value-added device that empowers everyone to keep the earth cleaner, was created in 2005 by inventor Anthony Karg. This patent-pending, pressure-sensitive adhesive mechanism is flexible, convenient and easy-to-use. Nap-Stik not only eliminates the struggle of keeping napkins in place, but it reduces waste and saves money. Nap-Stik provides a unique opportunity to businesses and individuals to customize their Napkin Helpers with a personalized design for promotional or personal use. Add value and peace of mind to your dining experience by joining with Nap-Stik in making this a better planet. For more information, please visit www.nap-stik.com. Finally, a napkin helper that really works!